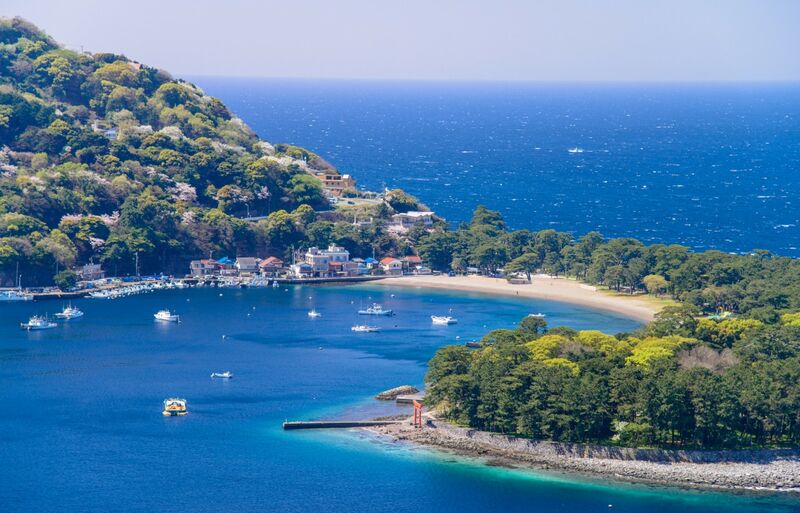 If the intense heat of summer in Japan starts to get you down, there's nothing like a trip to one of Japan's many beautiful beaches to lift your spirits and cool you off! But there are a few things to be aware of if you want to make the most of your time on the sunny, sandy slices of paradise that are Japanese beaches. "Beach season" is a common term in English, but it's quite literal in Japan. The official Japanese word for the opening of a beach is umi-biraki, which signifies the official start of beach season. Before the umi-biraki ceremony, beach organizers clean, stock and organize the beach houses, put out nets to keep sharks and jellyfish out of swimming areas and also test the water to make sure it's safe for patrons to swim in. Traditionally, Shinto priests conducted a ceremony to pray for safety, and some beaches have continued the tradition to the present day. The exact date of umi-biraki depends on where a beach is located in Japan. Like other seasonal events, it typically starts in southern areas and spreads northward. Generally speaking, beaches begin opening in Okinawa as early as April, moving up through Kyushu and Shikoku before spreading throughout Honshu in July. They continue to open until they reach the northern isle of Hokkaido, which sometimes takes place as late as August. It's difficult to find out when beaches open without researching in Japanese, so stop by a local tourist board or visitor center when in doubt! • Towels: Obvious, but you'll definitely want to be able to dry off. We recommend bringing extra towels for when you leave—do not underestimate how annoying (and inconsiderate) it is to have sand covering your feet while using public transportation. • Blankets: Although towels will also do the trick, a large blanket (or a sturdy tarp) is a great buffer from the hot sand, and provides a nice place for a picnic. • Parasols: Not just for debutantes, parasols are actually the best way to shield yourself from the hot sun. Some beaches offer parasol rentals (sometimes along with beach chairs), but if you want to save some hard-earned yen, bring your own! • Tents: Hear us out! It isn't uncommon to see beach bums in Japan set up a tent and spend the day by the seaside. It can help keep you and your stuff free of sand, shield you from the sun and it provides a little privacy if you want to take a rest. • Food & Drinks: While many places will have beachside restaurants or concession stands, they can get quite crowded and are usually a little pricey. Pack your own food and drinks (especially water!) ahead of time, or stock up on snacks and libations at a nearby convenience store. • Games: Nothing like a game of volleyball, badminton or frisbee on the shore! Many places in Japan are also prime spots for some boogie boarding or surfing, so plan ahead of if you want to shred. • Sunscreen: We've all suffered through the comically red skin, painful itchiness and intense despair of a bad sunburn after a day at the beach. Don't make the same mistake twice! Be sure to bring plenty of sunscreen (waterproof, if you plan on swimming) and apply it liberally throughout the day. Now let's go over some helpful tips to remember when going to a beach in Japan. Some of them might seem like a no-brainer, but there are some that are particular to Japan, so take note! • During the off-season when beaches are closed, there’s no swimming allowed since there is no active lifeguard on duty and there are no precautions taken to ensure a swimmer’s safety. Keep this in mind if you are thinking of heading out for an off-season swim. • Clean up after yourself! This might seem obvious, but some places in Japan might not have public garbage receptacles. If there are no garbage cans nearby, take the trash home with you. Help keep those beaches clean and pristine. • Just like at onsen, some beaches don't allow visible tattoos. You may want to bring some breezy summer clothes, concealing swimwear or waterproof bandages to follow the local rules and avoid making others uncomfortable. • Although some beaches will have nets up to keep out jellyfish, you definitely want to watch where you are going so that you don't run into a jelly's barbs. Those stingers pack quite the punch! Similarly, sharks aren't unheard of. Be aware of signage that indicates dangerous areas, whether it's due to wildlife, strong currents or anything else. • Keep an eye on any pets, children or older relatives with you. Not only are the elderly and young more susceptible to the heat—which is very intense in summer—unsupervised swimming can be dangerous for pets and children. • Japan doesn't have open containers laws like many western countries, and drinking in public is allowed. Some beaches may have policies in place that prohibit consumption of outside alcohol, so be aware. It's also important to limit alcohol consumption in intense heat, or if you plan on swimming. If you do drink, be responsible and considerate of those around you. • As mentioned previously, games are a really fun part of going to the beach. Having a picnic ruined or a nap interrupted by a stray ball or wayward frisbee isn't. Be sure to give yourself enough space for whatever activities you have planned. One of the most uniquely Japanese activities to enjoy at the beach is suikawari. The rules for this game are quite similar to those used in hitting a piñata—the active participant is blindfolded and spun around, then released to have a whack at a juicy watermelon. Those watching can direct the person holding the boken (a long wooden stick) to the watermelon or they can purposely mislead the player to cause some chaos. The best part is, this game has no losers! When someone finally cracks that watermelon open, everyone can enjoy its sweet, refreshing innards! Once the sun is down, another classic activity is fireworks! You can only light your own fireworks at certain beaches, so you'll want to check the policies online or at the site to make sure that it's allowed. If you're looking for something on a grander scale, beaches are also the best places for summer hanabi, or fireworks. The largest show that takes place during summer is the Nagaoka Festival located in Akita Prefecture. This festival originated after World War II on August 1, 1946 as a way to lift the spirits of the residents of Nagaoka so they could focus on rebuilding after the war. The event has grown since its conception and now has 20,000 fireworks that are launched into the night sky. The 2018 Nagaoka Matsuri festival will last from August 1 to August 3, but there are plenty of other local fireworks displays throughout the country to enjoy too. One of the best part of Japanese beaches are the umi-no-ie, or beach houses, that are dotted along popular coastlines. Here, you can eat to your heart's content with tasty summer classics like yakisoba, or cool off with a nice, tall beer or some sweet kakigori shaved ice. Beach houses also often have facilities like changing rooms, showers, bathrooms and lockers that will keep your valuables safe so you can focus on just having fun. You can also buy or rent equipment like parasols, inner tubes and even bathing suits! Boogie boards or body boards are available to rent at some beach houses as well. There are a couple of things to keep in mind though. First, beach houses are only open during swimming season, so if you're looking for a place to relax at any other time of the year, you're out of luck. Second, like other hot commodities, beach houses (and their amenities) are in limited supply, so it pays to go early if you want to snag a table, rent a parasol or procure a locker. Finally, although they usually serve alcohol, they often prohibit smoking and ask customers to refrain from getting too rowdy. Let's start off with a couple of beaches near everyone's favorite bustling metropolis, Tokyo! For the summer 2018 season, Yuigahama is open from July 1 to August 31, and operates from 10 a.m. to 5 p.m. However, you can surf and walk your dog along the beach outside of these hours. You can even set off fireworks any time before 10 p.m. But before you head off to Yuigahama, you may want to familiarize yourself with some of the rules that are listed on their website. Two important rules are to cover up any tattoos when you are on the shore or in the beach houses, and alcohol outside the beach houses is not permitted. Yuigahama is just a 45-minute train ride from Shibuya Station to Kamakura Station on the JR Yokosuka line. It's very popular and gets crowded quickly, so if you want a prime spot try to plan on getting there early. After a sightseeing stroll to the Great Buddha of Kamakura and other areas, hop on the Enoshima Densetsu Line and get off at Enoshima Station to arrive at Enoshima Beach. 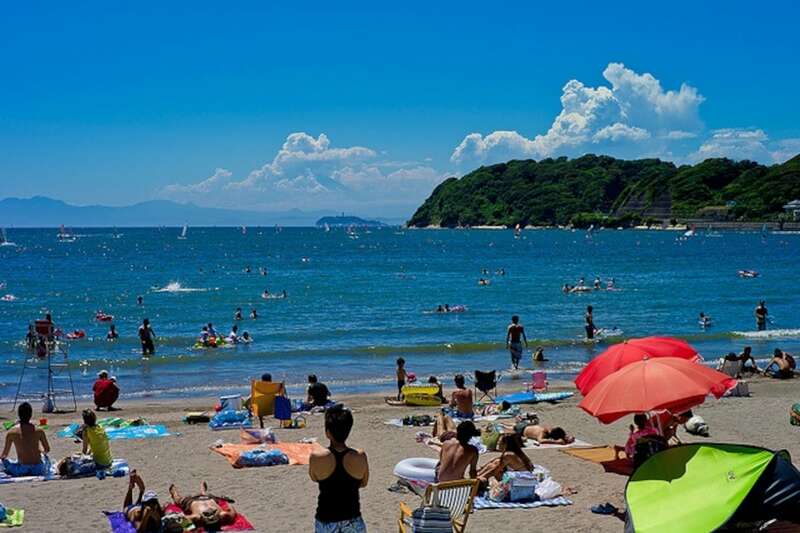 Sometimes referred to as "Miami Beach of the East," Enoshima's shoreline stretches five kilometers (about three miles) and has over 20 beach houses. Pay ¥1,500 (about US$13.50) per adult and ¥800 per child for complete use of all the beach house's amenities including toilets and showers. This beach typically sees around 1,000,000 visitors every season, so it can get quite crowded. Therefore, the rules here are slightly more strict, which means no barbecuing, camping or fireworks. It usually opens from July 1 to August 31, and operates from 9 a.m. to 5 p.m. If you're coming straight from Tokyo without stopping in Kamakura, get off at Katase-Enoshima Station on the Odakyu Enoshima Line. If you head to Kansai you'll find many beaches that are easily accessible from Osaka, including a few that are relatively unknown outside the region. Famous for white sandy shore and clear blue waters, as well as two designated BBQ areas, beach volleyball courts, and designated bonfire areas, Tannowa Tokimeki basically has it all! Plus, from late March to early June you can also engage in another local pastime, clam digging! What could be better than catching some fresh clams and grilling them up yourself at the nearby grilling station? Tannowa Tokimeki Beach is typically open from July 1 to August 31 and operates from 8 a.m. to 5 p.m. It's one hour and 30 minutes from Osaka Station to Tannowa Station on the Nankai Line, which includes a 14-minute walk from Tannowa Station. Sometimes referred to as Tarui Southern Beach, in addition to swimming, visitors to Rinkuminamihama can also enjoy various water activities, like windsurfing, rafting, and fishing in designated areas. It's also fun to lay back under the palm trees and watch the airplanes fly by from Kansai International Airport. In 2010 and again in 2014, the beach was closed from July until September, due to the influx of sea turtles laying their eggs. However, this 2018's swimming season starts on July 7 and lasts until August 19. The times open for swimming are from 9 a.m. to 5 p.m.
Rinkuminamihama also has beach houses, complete with lockers, showers and various swimming equipment including parasols, folding chairs as well as mats. Rinkuminamihama is just a 10-minute walk from Tarui Station on the Nankai Main Line. Now that you have a few tips on where to go and what to bring, get out there and enjoy your beach adventure!